A pressure washer gun or wand gives you added cleaning capability and allows access to hard-to-reach areas. Find the best pressure washer gun and wand here! Pressure washing, also called power washing, effectively removes dirt and grime, decreases risks, cuts down allergies, and boosts aesthetics. Its effectiveness is further enhanced by the use of pressure washer guns and wands that allow a longer reach and suitable spray width and angle. However, choosing the best pressure washer gun and wand that can meet your cleaning needs can sometimes be confusing. In this article, let me present to you the best types of pressure washer guns and wands and the benefits of using them. Let me guide you on how to choose the gun and wand most suited to your needs. This article also provides a review of the different brands and models that will definitely give you your money’s worth while maximizing your pressure washer’s capabilities. In effect, using these guns and wands can make your cleaning tasks much easier and faster to accomplish. Using the right pressure washer wand can help you complete the task quickly. The Best-Value Pressure Washer Gun/Wand! Differentiating between a pressure washer gun and wand can sometimes be confusing to the buyer. Let me just put it simply. A pressure washer gun is a mechanical device that is attached to the exit hose of the pressure washer. It serves as a switch or valve that allows the water to pass through when you squeeze on its trigger or handle. Trigger guns are designed in such a way that the ball bearing fully conforms to the outflow valve, thus ensuring that it operates without a leak. When you squeeze on its trigger, the motor is activated to pressurize water, as well as maintain a steady flow. This kind of pressure washer gun allows water to trickle out even when the trigger has been released and turned off. This prevents water from freezing when the hose is run across a frozen pavement or ground. However, the constant on-off cycle decreases the lifespan of the gun. This type of gun is not recommended for daily or regular use. This type of pressure washer gun is like a weep gun. However, instead of only one tube, it comes with a second one that allows water to keep on flowing but redirects it to a low-pressure nozzle. This avoids the pump from overheating, maintains the temperature of the water, and prevents it from freezing. However, you have to turn off the pressure washer for the water to completely stop flowing. These are also called straight guns. As the name implies, they are not angled, thus comfortable and easy to hold and effective in washing areas that are higher than you. Front entry trigger guns are usually used when low-pressure water is needed. These include cleaning the roof and washing of automobiles and other vehicles. The back entry trigger gun is the most common type of pressure washer gun. These are preferred for high-pressure applications. They are effective in removing oil, lubricants, and grease. In addition, your hose will not be in the way as you go about your cleaning chores. On the other hand, a pressure washer wand is an attachment to the gun and sometimes serves as an extension of the gun itself. It allows the water to be sprayed to greater distances and heights and at certain angles. The spray intensity is regulated by the nozzle attached to the wand’s end. These attachments are usually powered by the force of the liquid running through them. Pressure wands are used for cleaning the undercarriage of vehicles like trucks, cars, and RVs. They are also used for cleaning farm equipment. These wands are also effective in cleaning the grime from under your motorhomes, boats, and boat trailers. Wands can be used for blasting the graffiti and dirt off your walls and sidewalks. They can also effectively remove paint, scale buildup, and rust. Even with proper care and maintenance, your spray gun can get broken, chipped, or damaged. It deteriorates as time passes and with frequent use. Here are some tips to guide you when buying a new one. Choose a pressure washer gun that provides you with a firm and comfortable grip for ease of use and maneuverability. It also protects your hands from the hot water when you use a hot water pressure washer. An ergonomically-designed grip allows for a snug hold and reduces operator fatigue. If you frequently use the pressure washer for car washing, roof cleaning, and other low-pressure operations, choose a front entry trigger gun. On the other hand, if you need to do high-pressure cleaning tasks, choose a back-entry trigger. This also prevents the hose from getting in your way. For consumer electric washers, be sure to check the brand and model number of your pressure washer and check if the trigger gun is compatible with it. In certain models, an adaptor may be required or a universal replacement gun is more appropriate. A consumer gas washer requires a threaded M22 fitting while a professional grade washer requires either a quick-connect or an M22 attachment. It is important to check the specifications of your pressure washer to choose the trigger gun appropriate to your model. Be Sure To Get A Spray Gun That You Can Clearly Use With Hot Water, Especially If You Have A Hot Water Pressure Washer. If you intend to use the pressure washer to remove oil, grease, and adherent dirt, then the hot water pressure washer is your best option. In addition, you need a spray gun that is specifically engineered to handle hot water use. Using a cold water pressure washer gun or wand for hot water use can damage the machine’s pump, as well as its hose and spray gun. Hot water pressure washer guns use usually have vented lances. The vented lance can withstand high temperature and high PSI level. Thus, you can hold the spray gun comfortably despite using hot water. Gas pressure washers require wands with the correct grade. You should choose the wand that you need; a consumer-grade one for your personal/household cleaning needs and a professional-grade wand for commercial and industrial use. In instances that you want to shift between different spray patterns, you can choose a quick-connector to quickly and easily change the nozzles of your wand. Electric pressure washers, like Sun Joe pressure washers, do not have the same strength as gas pressure washers. You can choose plastic wands that are easy to connect. There are bayonet-style wands that you can easily twist-and-lock into the trigger gun. Telescoping or longer wands are ideally used when splashback is an issue or when you are cleaning a surface far away from you or in an area above your head. They can extend from 1- 3 feet, so these will no longer be a problem. The material the wand is made of impacts on its weight and tolerance to water pressure. Wands made of aluminum are definitely lighter. However, they need to be thicker in order to bend easily and handle high water pressures. Stainless steel wands are thinner, yet are able to handle water pressure well. Zinc-plated wands, on the other hand, weigh just in the middle but can rust if exposed to bleach and other chemicals or if they are not maintained properly. Flexible wands allow easy cleaning between vehicles. They let you maintain an optimal stream of water when reaching areas at irregular or odd angles. If you want a pressure washer and variable wand bundle that can provide you with the greatest flexibility, then the Apache 99023801 2600 Pressure Washer Gun and Variable Kit is the one for you. Its variable nozzle allows you to adjust between zero to forty degrees, thus making cleaning at both low and high-pressure settings easy. It features a trigger lock that helps avert accidental spraying. This gun and wand kit is good for cleaning all types of surfaces, especially patios and decks. If you need a replacement gun for your 2600 psi pressure washer, this is definitely your best choice. The kit comes with nozzles that have several settings and allows flexibility in spraying direction and pressure. You can easily and effectively take out dirt, grime, and oil on almost all types of surfaces. The Apache 99023801 2600 Pressure Washer Gun and Variable Kit gives you value for your money. It is cheaper than other brands but gives a good performance. It is easy to use and easily connects to standard M22 fittings. Spare bushings are provided, making it easy to fit most kinds of pressure washers. This kit handles water pressure well, so switching from stream spray to fan spray is a breeze. The kit does not work on Snap-on pressure washers. If you need to clean your driveway, patio, deck, or your original pressure washer gun needs to be replaced, the Briggs & Stratton Pressure Washer Gun Up To 3000 PSI 204627GS is your best bet. It is compatible with most brands and easily attaches to M22 fittings. You can effortlessly tackle tough cleaning tasks with its 3000 psi water pressure output. Its brass and stainless steel parts are corrosion-resistant. Its compact design and size make it easy to hold and use. Thus, you do not have to exert much effort in carrying it and pointing it from one area to another. The nozzle and wand are sold separately. May cause hand fatigue when used for a long time. The MATCC Car Washer Gun 3000 PSI High Pressure Washer Gun has a pressure output of 3000 psi, making it ideal for the tough cleaning jobs on driveways, sidings, and roofs. In addition, it can also be used easily for your vehicle washing chores. Cleaning different surfaces is an effortless thing with its 5 easy-connect nozzles. These nozzles are color-coded so that you will not have a hard time selecting the nozzle for your cleaning job. The colors are black for soaping, white for plain washing, and green for washing and cleaning. The nozzle for peeling and stripping is yellow. If you need to do blasting jobs, the nozzle to use is the red one. This gun allows you to get closer to the area you are working on. It even lets you hold items while washing them. 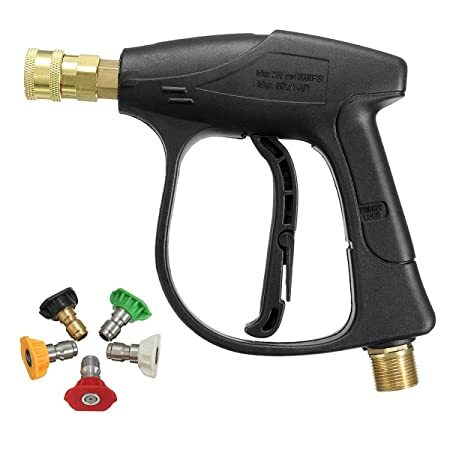 The MATCC Car Washer Gun 3000 PSI High Pressure Washer Gun comes with a ¼-inch quick-connector, which easily fits most standard hoses for pressure washers. It comes with color-coded nozzles that help you choose the correct one appropriate for your cleaning needs. This gun is not just for professionals even enthusiasts can quickly learn to use it. It is very easy to maneuver and lets you reach areas where a wand could just get in the way. This pressure washer gun is not compatible to use with a garden hose. It also does not fit the 3/8-inch hoses. It requires the pressure washer machine to have more than 1000 psi water pressure and 2 gallons per minute flow rate to work efficiently. 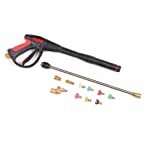 When you need to do a lot of cleaning on your sidewalk, garden, and driveway, and your pressure washer needs to have some parts replaced, then you should get this Pressure Washer Gun Accessories Kit. It allows you to do high-pressure cleaning at a maximum of 4000 psi. The kit includes a 19-inch replacement lance, two male adapters, and a pivoting coupler that is easy to install. It also comes with seven color-coded sprayer tips so that you can use the right spray for every cleaning task. Use the black tip when the cleaning task makes use of detergents, white for washing screens and windows, green for cleaning sidings, painted surfaces, fences, wood, and lawn mowers. If you need to remove stubborn dirt, oil, and stains, especially on hard surfaces like concrete or brick, then you can use the orange spray tip. The red spray tip is for hard-to-reach areas, as well as for cracks and gaps on your driveway and sidewalk. Lastly, the kit includes 2 jet stream nozzles that give a strong and steady stream with a longer reach than the usual spray tips. What’s even more amazing is that these are color coded, pink for use in cleaning with detergents and blue for rinsing. The Pressure Washer Gun Accessories Kit enables you to do high-pressure cleaning with less effort, as it as all the needed attachments you need. The color-coded spray tips and nozzles let you have the right water spray and pressure suited to the cleaning job. The attachments can be easily and quickly installed. It comes with a pivoting coupler that gives your wand 3 angles to work while allows a quick 90-degree rotation. Reaching into spaces that are tight is now a breeze with its adjustable spray nozzle. The screws on the plastic housing need to be tightened regularly. 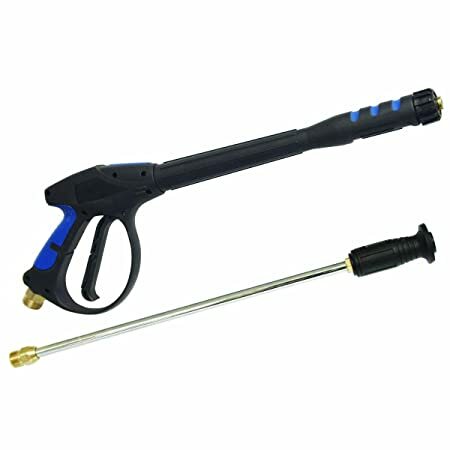 The best pressure washer wand and gun is the Washer Pro 4000 PSI Pressure Washer Wand and Accessories Kit. It comes complete with a gun, a 19-inch wand that extends the length of your hose. I can easily reach under the vehicles and around corners with this extension while focusing the stream on areas that need a more thorough cleaning. This wand also allowed me to clean hard-to-reach areas like the sidings and roof of the house without using a ladder. The best part of this kit is the set of spray nozzles. The color-coded spray nozzles make it easier for you to choose the right one to use, thus avoiding delays and waste of time, water, and effort. Plus, I did not have a difficulty in switching nozzles as they are all quick and easy to connect. This pressure washer gun accessories kit works best with pressure washers with at least 2000 psi pressure and a consistent water flow rate of 2 gallons per minute. You can use this for clean-up jobs in almost any area. Pressure washer wands and guns definitely make your cleaning tasks easier with much less effort and more efficiency. They enable you to choose the right spray settings, as well as reach areas that you normally could not do without a ladder. They also provide you with the appropriate spray settings that you need for your pressure washing jobs on virtually any surface. How about sharing with us your experience with any of these products? It would surely help others to know which one to buy. Please do not forget to share this article!